Today, I've got some more goodies to show you from the Born Pretty Store! I received these a couple days before Valentine's Day and was supposed to do a Valentine's Day review, but with my incident I wasn't able to. I've been reviewing items in the order they were sent since then. I hate that it's taken this long. I decided to still do something Valentine's Day related. That I might wear if I had a Valentine's Day date (my hubby doesn't celebrate it so we don't do anything for it). I received two products so I am only showing off one today and you'll see the other one next week! They were a little bigger than I was expecting when they arrived, but I knew I could still work with them. For some reason, when I see black and white polka-dots my brain immediately wants to go to red. I had to stop myself from grabbing reds on several occasions. I opted to go with black, white and pink. All just happened to be Cult Nails. Cult Nails - Nevermore, Tempest and Bad D.N. Everything used in the making of this mani. Final product and I absolutely LOVE this! This mani was SOOOOO easy. I started with Cult Nails Get It On then topped with two coats of Bad D.N. and a coat of Cult Nails Wicked Fast. When that was set I put a little bit of Nevermore on a paper plate and used a small paint brush to pant the lines I wanted on my nails (diagonals on pinky, middle and pointer and Vs on ring and thumb) and filled in the area I wanted black. I then added a second coat of Nevermore and topped with Wicked Fast again. Then I added some Tempest to my paper plate and used a dotting tool to make dots along the lines on the Nevermore side. I waited 10 minutes to let it set before I topped with Wicked Fast again and some of my dots still ran. :o( Once I got over that I added a drop of Seche Vite where I wanted to place the bows and pressed down and waited for it to dry. Easy! Absolutely in love with this mani and these bows!! Yes, only 10 came in the package, but when I took them off, I just cleaned the back of them with a Q-Tip and acetone and tossed them back in the package. So they are easily reusable! That's a huge plus to me! Now, I'm thinking about getting some more, but in other colors. The only downside to these is I wish they were a bit smaller because I have tiny nails. If I were to need a mani for a short period of time and not one that would last, I would do this again in a heart beat! 10 bows in a package for $2.33. For a reusable item, that's fantastic! AND free shipping! 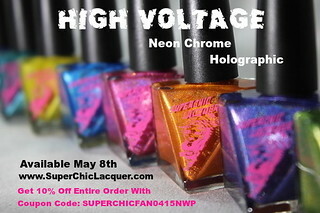 PLUS don't forget about my 10% off code EQL91. 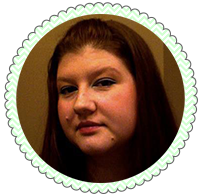 They are still waiting on my code to be used 10 times so they can sponsor a giveaway for my readers! 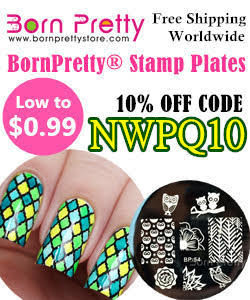 Born Pretty Store has great products for nail art (and they have so much more in their shop)! If you haven't shopped with them before. I highly recommend it!